Fugitive dust is created in various ways throughout many different industries. Without the implementation of proper suppression techniques, this unwanted dust can cause harm and irritation to those it comes into contact with. These migrant particles can leave short and long-term effects on those impacted depending on varied factors such as duration, composition, and areas of contact. To avoid the risks associated with mass dust creation, many dust control techniques have been implemented over the years. Containing, collecting, and suppressing dust particles all serve the purpose of protecting the people and environment near its creation. BossTek's DustBoss line of dust control equipment suppresses undesirable, generated dust to keep the environment and workers safe. Controlling dust particles using atomized mist, DustBoss is applied throughout the industries to protect those from harmful dust. Over the next coming months, DustBoss throughout the Industries will look at these sectors to understand dust creation and suppression implementation. At the start of the chain, heavy dust is created in the demolition industry. Tearing down buildings, parking garages, and other large edifices create a lot of unwanted dust. Demolition sites work through a wide range of materials that were used to build the structure. Gathering and sorting these dismantled materials is done with a plan for reuse in another industry, and executing the process with heavy machinery is a large source of dust generation. This is where DustBoss starts its work. Suppressing dust generated during the tear down and the relocation of construction materials is easily handled by the cannon units from BossTek. 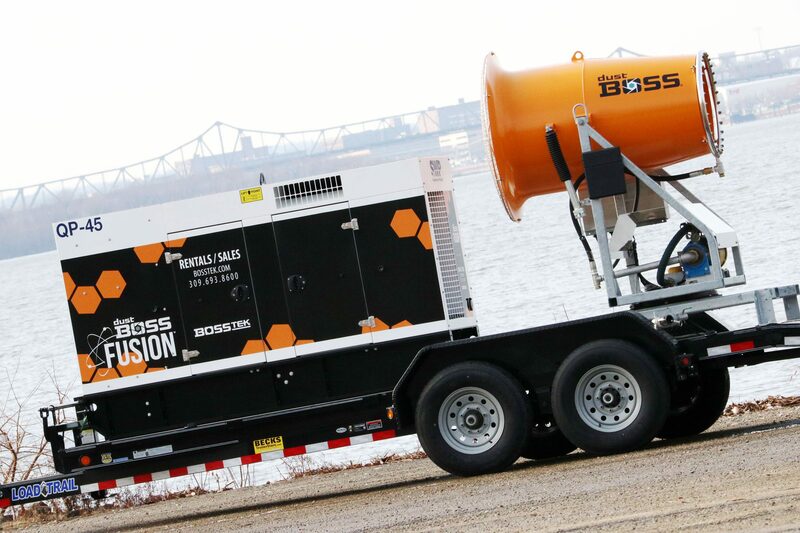 Commonly used on demolition jobsites, the Fusion line of DustBoss units provide self-powered dust suppression equipment by pairing a cannon unit and genset together. Mounted on a roadworthy trailer, the Fusion provides excellent mobility to reach desired locations on demolition structures. 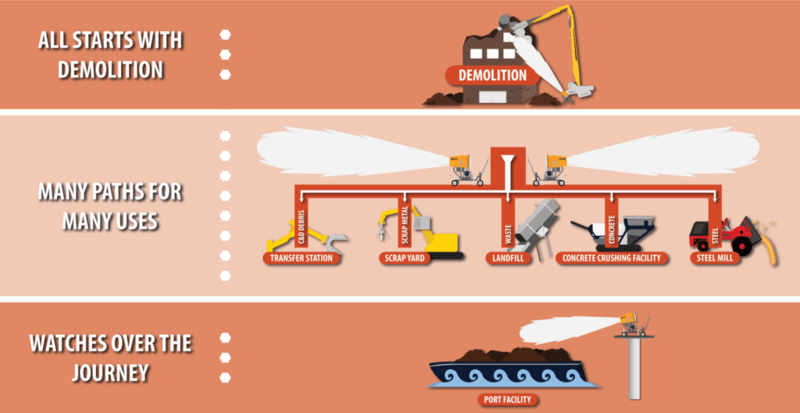 Once the material from the demolition has been collected, it is transferred to its next stop along dust-related industries. The material transferred from the demolition jobsite now has plenty of options for where it will end up next. Each type of material has a unique industry it will be transferred to. Most of the time the destination is based on what type of material it is. C&D debris gets transmitted to transfer stations, scrap metal goes to scrap yards, waste moves to landfills, concrete passes on to concrete crushing facilities, and steel ships to steel mills. Each industry uses these materials in diverse ways to support their working functions. In concrete crushing facilities, the industry-tailored, concrete jaw crushers break down debris into smaller pieces for easier transfer and functionality. 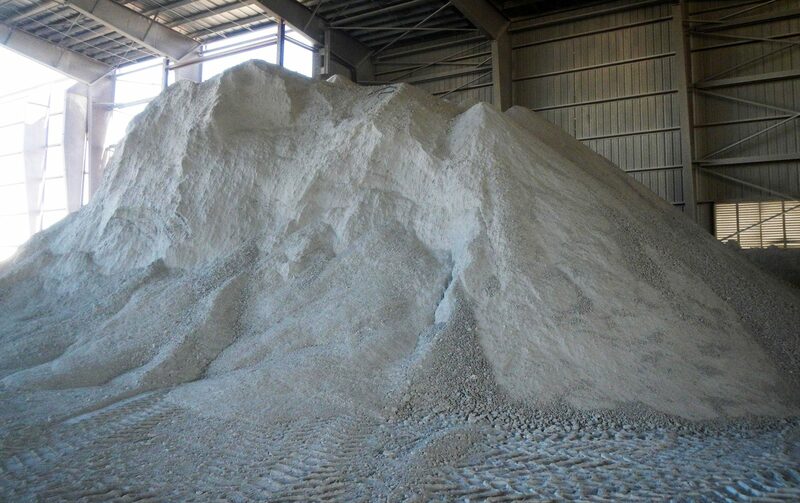 During the crushing and transfer processes, large amounts of dust is created. Here, DustBoss is on the scene. The units prevent the harmful dust from affecting the workers and surrounding environment. These various paths all have creation points of dust. Whether it's shredding scrap in a scrap yard or tipping waste at a landfill, they all have DustBoss to control the fugitive particles and protect the surrounding area. Once the materials process through these industries, the components either stay to be reused within that industry, or it ships out once again to be exercised in another production. Even before making it to the materials' next processing industry, dust is created, and DustBoss is there to control it. Often, industrial materials are transported and shipped via waterway for effectiveness and efficiency. Many times demolition material that has made its way through scrap yards and concrete crushing facilities is taken to ports in order to ship in bulk more efficiently. At port facilities, the materials are loaded onto massive barges that haul considerable amounts of demolition remains to their next destination. During this loading - and unloading - process, significant amounts of dust is created when transferring the contents onto the barges. DustBoss units implement optimal dust control using atomized mist to suppress the fugitive dust during loading. Frequently, the units are placed at a higher elevation than the material to provide maximum suppression by driving the dust to the ground. The materials continue to a new industry until they reach the point of functionality once again. From demolished building to processing facility to roaming the open waters, DustBoss is there every step of the way to make sure the workers and environment are safe, hoping to see the material be used again. This entry was posted in Blog, DustBoss. Bookmark the permalink. Both comments and trackbacks are currently closed.